Very insightful blunders David. Everything I can think of falls under these seven categories. I’ll keep these blunders bookmarked for future references. Thanks for sharing man. .-= John´s last blog ..How to Add Blogging to Your To-Do List =-. Interesting list David. 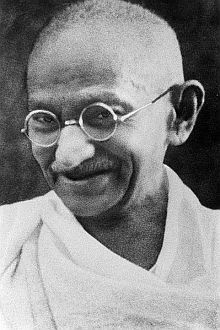 Despite being Indian, i strangely have not read much about Ghandi, but it sounds like some of his words will be instrumental to personal development. Gandhi had a some trouble with the scene in the Mahabharata, where two huge related armies were about to massacre each other, and Arjuna, is reluctant to kill, but the god Krishna advises him to continue, for it is already ordained. This advice is the Bhagvad Gita. Gandhi did not like that Krishna was promoting violence. He later came to understand that the devastating war is symbolic of the internal war of thoughts and emotions–they are ephemeral and irrelevant. With the Gandhi’s life unfolded, his wisdom is always down-to-earth and imminently practical. Gandhi was an amazing man. He fasted and meditated often, which I believe gave him such clear insights. He didn’t overcome great obsticles with shear will power; but he did overcome by humility and grace. A lesson I re-learn occasionally. Thanks for bringing this info to your readers today. You are an uncommon man with interesting insights to share with all of us. .-= prayerthegate´s last blog ..Bless You =-. Thank you! I definitely cannot take any credit here; I didn’t even editorialize like I usually do. You have a very thought provoking site here, one I will be visiting regularly. Thank you for your insights on life, drugs, social expectations and the ease with which we can live our own lives our own way when we want to. What can I say about Mahatma Ghandi, his thoughts are simple and succinct. perfect in their simplicity. If only I could maintain them, But I guess we are all in the same boat there. .-= brigid´s last blog ..Are Friendships Really That Important? =-. Thanks Brigid, I appreciate your comment. You’re right, we’re all in the same boat. Sometimes that’s a comforting thought. Love this post. Simple. Direct. Powerful. .-= Dayne | TheHappySelf.com´s last blog ..What If? =-. Or #2, “Pleasure without conscience”… again, surely “conscience” is a vital component of ANY human endeavour. Love your blog. It’s full of goodness, just like I like. Found it today. Will definitely be coming back and adding it to my blogroll. .-= Nadirah Angail´s last blog ..On Why I Often Ignore Doctors’ Advice =-. Very good article. Realized me that I am loosing my principles. .-= science health´s last blog ..Symptoms, precautions and treatment of H1N1 Swine Flu =-.